Special envoys for South Korean President Moon Jae-in reportedly met with North Korean leader Kim Jong Un Monday. 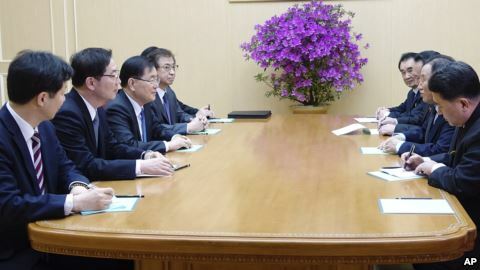 Moon’s office said the envoys were to meet with North Korean officials and to attend a dinner hosted by Kim. Observers note that this would be unusual for a North Korean leader. Kim has not met with any foreign leaders since he took power in 2011 after the death of his father Kim Jong il. Moon’s national security advisor, Chung Eui-Yong, led the 10-member delegation. The head of South Korea’s National Intelligence Service is also in the delegation. The group traveled on a rare direct flight from Seoul to Pyongyang, the North Korean capital. The envoys brought a message from Moon about removing all nuclear weapons from the Korean Peninsula and peace between the two Koreas. Chung said he would seek “in-depth” discussions to find a way to restart talks between North Korea and the U.S.
“For this, we plan to have in-depth discussion not only on South-North talks, but also ways to continue talks between North Korea and the international community, including the United States,” he said. 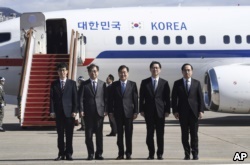 South Korea's national security director Chung Eui-yong, center, National Intelligence Service Chief Suh Hoon, second left, and other delegators pose before boarding an aircraft as they leave for Pyongyang. However, the diplomatic effort faces North Korean opposition to planned military drills to be held between the South and the U.S. in April. North Korea’s KCNA news agency warned that the North would, in its words, “counter the U.S.” if it holds the joint exercises as currently planned. 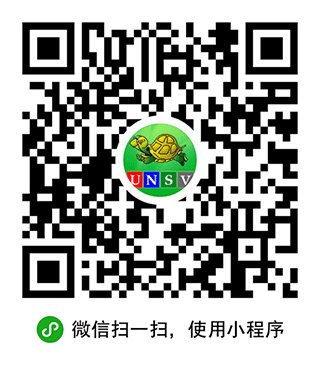 The military joint exercises were postponed because of the Winter Olympics in Pyeongchang, South Korea last month. Kim Jong Un sent his sister and chief of state Kim Yong Nam to the opening ceremonies of the Games. He also sent high-level party official Kim Yong Chol to the closing ceremonies. Moon spoke by telephone with U.S. President Donald Trump about the visit last week. After the two-day visit is complete, the South Korean special envoys are to travel to the U.S. to discuss their contact with the North. The U.S. placed another set of sanctions on the North last month that target individuals, companies and ships. Those restrictions are in addition to United Nations Security Council sanctions put in place since early 2016. Mario Ritter adapted this for VOA Learning English based on AP and VOA news reports. Hai Do was the editor.